Shinola is expanding its manufacturing capabilities, with the addition of a leather factory within its headquarters at the College for Creative Studies in the New Center area in Detroit. The Detroit-based manufacturer announced Tuesday that it expects to employ 60 leather makers by the end of the year — professionally trained through Braloba, a Swiss family-owned and operated business that has been making leather goods for two generations. Bock says Galli S.P.A., an Italian leather goods machine company, designed and produced a line of custom-built machines for the factory — the first of its kind in the world. 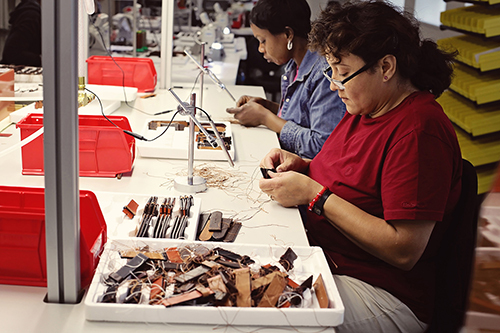 The 12,000-square-foot factory will begin by producing a portion of Shinola’s leather watchstraps and will expand to small leather goods and eventually handbags. This opening comes on the heels of Shinola’s announcement to open a sister store, Willys Detroit, in Midtown next month. The company also plans to open a flagship store in Minneapolis this summer, as well as other stores in Chicago, Washington, D.C., London, Berlin, and Amsterdam.